Waste is a human novelty. Circularity is inherent in the natural world; nothing is left discarded, unused or wasted. Americans generated 254 million tons of trash in 2014, according to EPA estimates. At least 136 million tons of that went into one of the more than 2,000 landfills across the country. The first modern landfill didn't open until 1937, an extraordinary expansion of waste management in only 80 years. 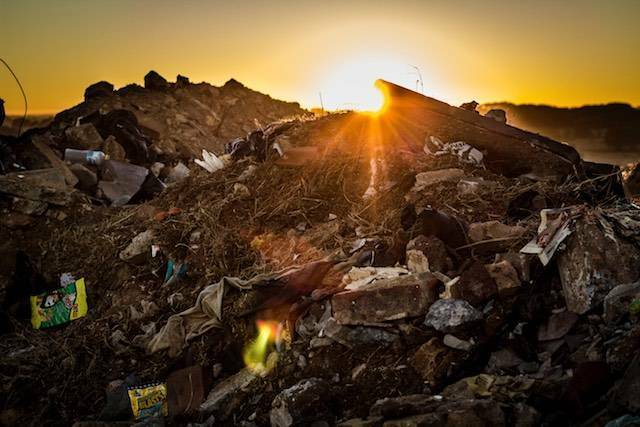 America has become a "land of landfills," as 3p correspondent Nithin Coca wrote on TriplePundit last year. According to those same EPA estimates, I will generate nearly 4.5 pounds of trash by the end of the day, as will every other "average" American. But what about the average American business? Here it gets even more complicated. In the rush forward into new technologies and industrial processes, the variety of materials entering the economy is now much more complex than when that first landfill opened in 1937. The challenge is not just the sheer volume that necessitates many "special needs" cases for waste management, but also the type and purpose of the original product. Take, for instance, materials containing proprietary or sensitive data. Nobody needs reminding of the perils of our hyper-connected, data-driven world. Terms like 'the cloud" suggest an ephemeral quality to data. But as anyone who's shredded old bank account statements knows, data lives in the "real" world. At the industrial level, data destruction requires a process of materials management not found in typical recycling facilities and certainly not at landfills. While secured and certified data destruction is an obvious example, it's not just hard drives and floppy disks. There are many materials, and many different reasons, for which assured destruction is the best solution. In situations like these, recycling or reuse is not an option. The good news is that this is an opportunity for companies to adopt a different perspective to the open-ended concept of waste. For Covanta, a solutions provider for industrial recycling, waste recovery and energy-from-waste production, one company's waste is another company's feedstock. TriplePundit spoke with Covanta's Stephen Diaz, Vice President, Sustainable Solutions. Of all the different types of situations and materials requiring specialized end-of-life handling, not once did Diaz refer to any of it as "waste." It's all feedstock to him. And "we do the gamut." Pharmaceuticals and discarded drug trials; discarded or recalled consumer package goods; food recalls; confidential industrial R&D, machinery and prototypes; cosmetics, lotions and creams; over-the-counter medicines and vitamin supplements: It's all feedstock for Covanta's energy-from-waste process (EfW) that bends that open-ended straight line of waste into a triple-bottom-line circle. Based on a lifecycle assessment approach, the U.S. EPA estimates that every ton of municipal solid waste diverted from landfill to an EfW facility will reduce lifecycle GHG emissions by one ton of carbon equivalent. The typical hierarchy of waste, an inverted pyramid, lists energy recovery as one of the least preferred options. But in certain situations -- such as the handling of personal information or decommissioned product -- it's the only option, Diaz told us. "It's very sensitive," Diaz said. "These customers don't want the product reused or resold." Covanta's assured destruction service uses an EfW process to incinerate materials at close to 2,000 degrees Fahrenheit. The heat creates steam to turn a turbine, which generates electricity to power the process. Excess energy is sold to the grid. Electronic waste containing sensitive information is managed through Covanta's Electronic Waste Recycling Program. Just as importantly, the assured destruction provided by companies like Covanta is certified and legally binding, offering added assurance for corporate clients. "We give quite a few certificates," Diaz explained, including everything from tax records to certification that meets several federal agency requirements. Assured destruction entails more than simply incineration. It starts with secured transportation from the client's location directly into the hopper, where it is fed into the boilers without being mixed with other materials. Clients can even watch the destruction from a viewing room if requested. "In some cases, they meet us there," Diaz told us of the business teams Covanta serves. "They watch it go right into the boilers." Before any of this happens, however, Covanta's team works closely with their customers to create a specific solution for their needs. Some customers know what they need and "know that we're the best at what we do," Diaz said. "They want to utilize our process [of destruction] in a secured manner." For others, Diaz went on, "We'll go and talk with them about their sustainable initiatives. We'll walk them through ... and in some cases, we do a little road trip and take them to the plants [so they can] see it for themselves firsthand ..."
"...and a marriage is formed about our sustainable environment and what they're looking for. Then we start talking to them about their different types of feedstock." That's when we'll "open the door for them." "When we're trying to solve a problem by providing a solution, we sit back and we listen." This customer-centric, end-to-end solutions approach has "worked out real well for us," Diaz said simply. Covanta's approach to end-of-life materials handling, from the top of the waste hierarchy to EfW, is an example of how to deal with the "dilemma of waste." As the common meme goes, "There is no away." The stream of materials thrown into that great away that doesn't exist makes it abundantly clear we've only begun to deal with the instability of a linear economy. As in nature, waste is only feedstock for the next cycle. Whether through specialized services like assured destruction or end-of-life solutions for municipal waste, we must push to make sure more of this feedstock finds its way to another use. And as the modern economy seeks to close the loop, companies like Covanta play an important role -- both as a service provider and partner to industry.